Archaeologists in China have made a gruesome find in a 5,000 year-old house. 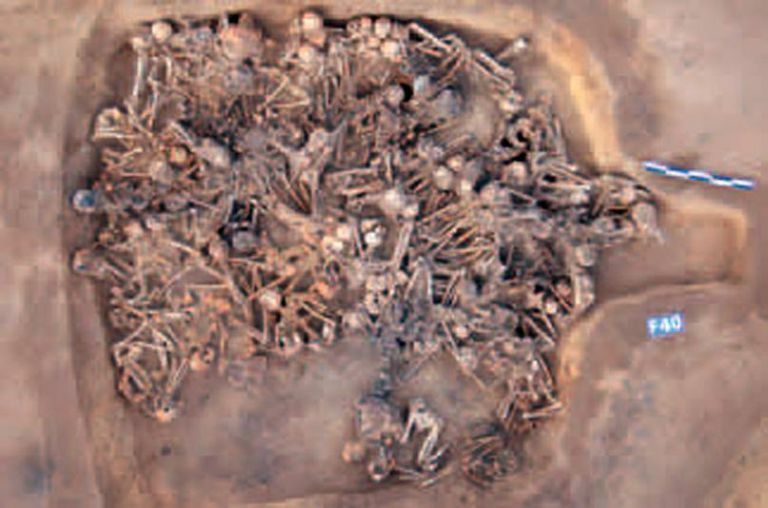 Stacked one upon another, the remains of 97 human beings were found in a space measuring approximately 14 by 15 feet in size. The excavation is located at a prehistoric site in northeast China. The bodies of teenagers and adults were crammed into the relatively small place, which was subsequently burned down. Some of the bodies were charred and deformed. Expert theorize that the burial provides evidence of a prehistoric disaster such as an epidemic. Now known as Hamin Mangha, the site goes back to a time before the invention of writing in China. At that time, the early Chinese lived in relatively small settlements where they grew crops and hunted for food. Besides the human remains, researchers found pottery, grinding tools, spearheads and arrowheads. 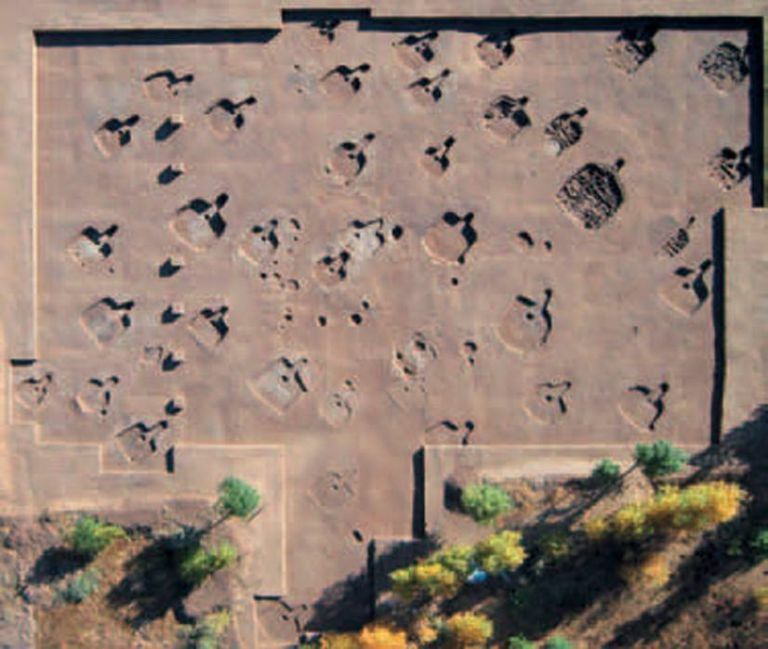 "Hamin Mangha site is the largest and best-preserved prehistoric settlement site found to date in northeast China," said the report, which is found in the journal Chinese Archaeology. The original report appeared in Chinese in the journal Kaogu. Between April and November 2011, archaeologists discovered 29 houses, most of which are simple one-room structures containing a hearth and doorway. The house with the bodies, dubbed "F40," measured 210 square feet. "On the floor, numerous human skeletons are disorderly scattered," the archaeologists wrote. "The skeletons in the northwest are relatively complete, while those in the east often [have] only skulls, with limb bones scarcely remaining," said the report. "But in the south, limb bones were discovered in a mess, forming two or three layers." At an undetermined point in time, the structure over the bodies burned down. The fired may have caused the wooden beams of the roof to collapse. The flames not only charred but also deformed skulls and limbs found on site by the archaeologists. The remains were never buried. The Jilin University in China team is seeking to find out what happened to these people. The team has published a second study, in Chinese, in the Jilin University Journal – Social Sciences edition, on their finds. The manner of burial shows that the dead came in faster than they could be buried. "The human bone accumulation in F40 was formed because ancient humans put remains into the house successively and stacked centrally," wrote team leaders Ya Wei Zhou and Hong Zhu in the study. The team found that about half of the individuals were between 19 and 35 years of age. No remains of older adults were found. The ages of the victims at Hamin Mangha are similar to those found in another prehistoric mass burial, which was previously unearthed in modern-day Miaozigou in northeast China, the researchers noted. "This similarity may indicate that the cause of the Hamin Mangha site was similar to that of the Miaozigou sites. That is, they both possibly relate to an outbreak of an acute infectious disease," wrote Zhou and Zhu. The scientists did not speculate as to what disease it may have been.